"And you will not be so hungry. My Saint Mary's College of California Jan Term students are beginning to consider the consequences of growing up with food insecurity and poor nutrition in our neighboring City of Oakland. This class is a community engagement course, one of Saint Mary's core curriculum requirements, and a distinctive for the school. When it comes to hunger, I plan to fill their minds with statistics, research, and facts, and they're using hands and hearts to work with children in the Oakland schools, but I still think there's nothing better than fiction to inform the imagination. 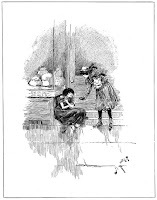 I remember hating fictional hunger in the pit of my nine-year-old stomach when reading about the Pepper family in THE FIVE LITTLE PEPPERS, Sara Crewe in A LITTLE PRINCESS, the Hummel family in LITTLE WOMEN, the Brinker family in HANS BRINKER AND THE SILVER SKATES, and the Ingalls family in THE LONG WINTER. What other children's books inform the imagination when it comes to the experience of hunger?